The Cathedral was built between 1895 and 1903 on the designs of architect John Bentley. The panorama is taken directly outside the Cathedral which is a through route for commuters arriving at London’s Victoria Station and walking to Westminster. 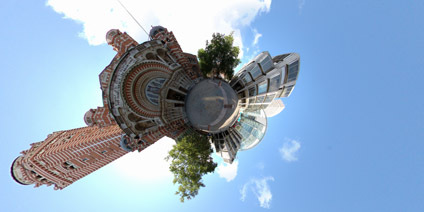 View the Quicktime panorama of Westminster Cathedral , London (2.7mb). If it’s not on there already – you should put this on Flickr.com Very cool!